Although most children still exit foster care through family reunification, exit patterns have changed over the last 8 years. Currently, reunification takes longer to happen, whereas adoptions happen earlier. A child's age and race are associated with the likelihood that he or she will be reunified. Infants and adolescents are less likely to be reunified than children in other age groups, and African-American children are less likely to be reunified than children of other racial/ethnic backgrounds. The principle of family reunification is deeply rooted in American law and tradition, and reunification is likely to continue as the most common way children exit foster care. Thus, greater efforts should be made to ensure that reunifications are safe and lasting. The article closes with a discussion of changes in policy and practice that hold promise for improving the safety and stability of reunified families, such as instituting better measures of state performance, and continuing to provide monitoring and supports for families after a child is returned home. For children in foster care, reunification with birth parents is often the primary permanency goal and the most likely reason a child will leave placement. About one-half of children placed in foster care will go back home to their parent(s) following what is often a relatively brief period in foster care. Within the larger context of child welfare policy and practice, the fact that most children go back to their birth parents after placement reflects the central importance of reunification as an outcome of foster care placement. outcomes and the problem of unsuccessful reunification “when children are reunified with birth parents only to later reenter the foster care system. Finally, the article concludes with a discussion of implications for policy and practice, with a focus on the key issues to be addressed if we are to improve the likelihood of children successfully reunifying with their birth parents. Family reunification can be viewed from multiple perspectives, such as the body of law that delineates parental rights and the implications of the law on public policy, the practices and decision-making processes child welfare agencies engage in when deciding whether to return children to their birth parents, and child and family factors that may affect the possibility of successful reunification. The following sections discuss family reunification in all of these contexts. Although the U.S. Supreme Court has long recognized the autonomy of the natural family and grants wide latitude to parents, the court does acknowledge the interest of the state to protect and promote children's welfare and to assure that children have permanent homes.4 The exercising of this authority emphasizes that a child is not the absolute property of a parent, although state action is limited to situations in which parents are proven unfit or unwilling to perform parental duties and obligations.5 Because the presumption favoring parents has to be set aside before any other caregiving arrangements are pursued (assuming the parents do not consent), reunification has to remain the primary goal of child welfare services until a permanent decision regarding parents” abilities to carry out their responsibilities can be made. Parental rights regarding children are frequently construed as a bundle of rights and responsibilities pertaining to custody, medical treatment, educational and religious decision making, physical and emotional care, and financial support. Generally, the parent’s rights are comprehensive and predominate over those of the child and third parties, including the state and relatives of the child. However, the bundle is divisible, and some rights can be conveyed to others for a limited duration, even as natural parents retain other rights. For example, parents can convey guardianship of a child to a third party during a planned absence. The guardian assumes day-to-day responsibility for the child (food, clothing, and shelter), but parents retain the right to make certain decisions on behalf of the child. Only in the extreme circumstance of termination of parental rights do the natural parents totally relinquish the bundle. For a court to challenge a parent’s fundamental right to the custody of his or her child, there must be a showing of parental unfitness. Even when parental unfitness is demonstrated, with few exceptions there is a residual presumption that it is in the child's best interests to be in the custody of the parent. Thus, subsequent to the determination of parental unfitness, the court conducts a separate best interests analysis, determining whether it would be in the best interest of the child to remain with the parent or to be placed out of the home. The legal standards for unfitness and best interests of the child are neither clearly defined nor exact. A court must balance competing interests (parents, children, and third parties) and examine various factors as it weighs the facts of an individual case in making its determination. Of the three acts, the Indian Child Welfare Act of 1978 (ICWA) contains the strongest language in favor of family preservation. ICWA requires proof by clear and convincing evidence for any temporary foster care placement and proof beyond a reasonable doubt for termination of parental rights. homes. It also contained fiscal incentives for states to avert and shorten foster care placements and to encourage permanency planning for children. Although the Adoption and Safe Families Act of 1997 (ASFA) specifically authorizes funding for time-limited reunification services, the focus on family preservation and reunification shifts somewhat to efforts to achieve permanency and stability for children through adoption.9 The act’s major features are a change in the time frame for the dispositional review (also called the permanency planning hearing) from 18 months to 12 months and allowing states to plan reunification and adoption concurrently by seeking adoptive homes for children. Significantly, ASFA requires the state to petition the court to terminate parental rights or to support the petition filed by a third party for children in foster care for 15 of the most recent 22 months. The concurrent planning process typically involves assessing which children are least likely to reunify and thus would most benefit from an alternative permanency plan. Under an alternative plan, a child is more likely be placed with a foster or kin family that is willing to adopt should reunification not be possible, and birth parents are made to understand that should reunification not be achieved, the child will be placed permanently with the foster or kin family. families intact. Only a few studies have attempted to explore the factors that lead caseworkers to recommend reunification. What can be gleaned from these studies is summarized below. One study designed to understand why reunifications fail identified the following case activities as essential parts of the reunification process: quality assessments including whether and when reunification should occur, quality case plans, family engagement, service coordination, family compliance with case plans, family readiness, and post-reunification services and monitoring. In the D.C. study, social workers cited four essential issues they considered when deciding to reunify a child. First, most workers were particularly concerned with how well parents had complied with the conditions set out in their case plans. Specifically, workers assessed whether birth parents had actively participated in any service referrals they were given, whether their behavior had changed, and their level of involvement in the daily lives and schooling of their children. Second, assessing the safety of the home was critical in the reunification decision. In addition to assessing necessary changes in the home, workers looked for evidence that birth parents had ceased problematic behavior that might endanger a child and had demonstrated improved parenting skills. Frequency of visitation was another critical factor in the decision-making process. arents who were unwilling or unable to visit or were inconsistent in their visitation patterns were less likely to be recommended for reunification than were parents who adhered to the visitation schedule. Finally, children's wishes were also a factor in the reunification decision, particularly for older children. It must be emphasized, however, that the lack of research in this area is troubling. Larger studies on factors that affect caseworker decision making are critical to improving the reunification decision-making process. The characteristics and circumstances of children and families also affect the likelihood of reunification. Reunifying a child with his or her birth parents is not a one-time event. Rather, it is a process involving the reintegration of the child into a family environment that may have changed significantly from the environment the child left. During the time apart, both the parent and the child may have encountered new experiences, developed new relationships, and created new expectations about the nature of their relationship. All these factors must be considered and accounted for when facilitating both physical and psychological reunification. Some studies have found that certain child and family characteristics can hinder or help the reunification process. To determine whether recent policy initiatives have changed exit outcomes for children in care, a clear understanding of trends and patterns in family reunification is a necessary first step. The Multistate Foster Care Data Archive is a longitudinal dataset that includes data on approximately 1.3 million foster children in 12 states.25 This dataset, with its extended follow-up period, allows a glimpse into the experiences of children who exited foster care 10 years ago or more and provides a valuable source of information on reunification. Several key findings have emerged from these data, including that most children are reunified; that age and race/ethnicity matter; that length of stay is linked to exit type; that reunification “not adoption “declined during the 1990s; and that rates of reentry following reunification are high. Each of these trends is discussed in more detail below. Most children leave the foster care system through reunification with their birth parents. Determining the simple probability that a child will leave the child welfare system through reunification is an important first step in understanding the dynamics of family reunification. 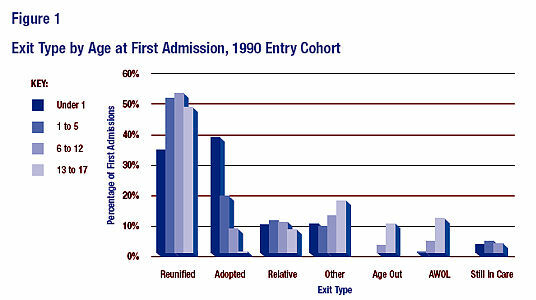 As illustrated in Figure 1, for every 100 children admitted to foster care in 1990, more exited through reunification than through any other exit type.26 With respect to family exits other than reunification, about 10% of children were placed with relatives. Note: Data taken from the Multistate Foster Care Data Archive, Chapin Hall Center for Children at the University of Chicago, available online at http://www.chapinhall.org/category_archive_new.asp?Ls=66&L3=123. Children's experiences with the foster care system vary significantly, depending on their age at placement and their race/ethnicity. For example, among children admitted to foster care after their first birthday, reunification was clearly the most common reason for leaving foster care. Slightly more than half of children who left foster care did so because they were reunited with their parents. Among children admitted as babies, however, adoption was the most common exit reason. Adoptions among older children, especially adolescents, were relatively rare. Instead of being adopted, adolescents who didn’t go home either aged out of placement, were reported as “absent without leave” (AWOL), were discharged for some other reason (for example, transfer to another child serving-system), or were placed with other family members. The amount of time children spend in foster care varies by type of exit. A child can and often will leave foster care after a brief placement, especially if the child is reunified. Simple measures of placement duration, such as average length of stay, convey little about the differences between adoption and reunification. 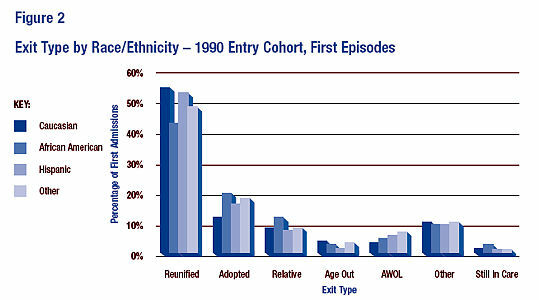 Figure 3 charts the likelihood of exiting to reunification and adoption for children admitted to foster care in 1990.29 The data displayed reflect the likelihood of reunification or adoption in the next year, given how long the child was in care. In brief, these data illustrate that reunification is much more likely to take place early in a placement rather than later. For example, the first year a child is in foster care, the likelihood (or probability) of exit is about 28%. Among children still in care after one year, the probability of reunification drops significantly over the following year, to about 16%. During each subsequent year, children who remain in foster care face a declining probability of reunification. The adoption process follows an entirely different trajectory. During the first year following placement, the likelihood of adoption is less than 2%. From a practice perspective, the lower initial likelihood of adoption means that only a few children entering care are readily identified by social workers as children who will be adopted. Although the data do not indicate why adoption is the obvious permanency choice, it may be that the child's parents are deceased, and adoption is the only appropriate permanency plan. After the first year, the likelihood of adoption rises steadily. is more likely to leave foster care through adoption. Although the children still in care are a relatively small proportion of the total number of children placed in 1990, their continued presence in the foster care system reinforces the need to monitor placements diligently. The experiences of these children also highlight why the underlying processes of reunification and adoption have to be monitored over an extended period before conclusions about the effectiveness of policies and practices can be reached. Meanwhile, periodic judicial and administrative reviews are important tools for evaluating children's ongoing needs and the appropriateness of reunification as a permanency planning goal. An analysis of reunification and adoption trends since 1990 indicates that contrary to popular conception, the rate of exit to reunification “not adoption “slowed during the 1990s. This particular finding is important because lawmakers at the federal level believed that adoptions were slowing during this period, a concern that led Congress to address the sluggish adoption process as part of ASFA. The passage of ASFA, arguably the most important piece of federal child welfare legislation passed since 1980, was largely driven by the substantial growth of the foster care population during the late 1980s and early 1990s, and the perception that adoption backlogs were increasing. In 1990, the estimated number of waiting children nationwide was just below 20,000, or about 5% of the total foster care population at that time. Five years later, 38,000 children were waiting to be adopted, representing about 8% of the total foster care population, even though the number of adoptions increased by 31% between 1990 and 1994. It appeared states were losing ground in the effort to expedite permanency, particularly in adoptions from foster care. Note: Data taken from the Multistate Foster Care Data Archive, Chapin Hall Center for Children at the University of Chicago, available online at http://www.chapinhall.org/category_archive_new.asp?L2=66&L3=123. Three different views of the exit data are presented in Figure 4. To the left, the data reflect relative rates of exit for all children admitted between 1990 and 1997, regardless of exit type. These data indicate little overall change in the rate of exit. That is, children admitted in 1995 were about as likely to leave foster care as children admitted in 1990. From this perspective, worries that children were leaving foster care at slower rates appear somewhat unfounded. The second panel examines the same data, except the analysis is restricted to children who were adopted. 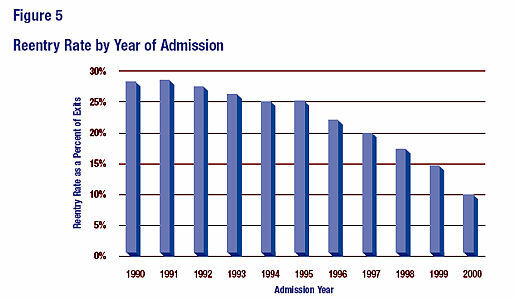 These data portray a different story: Each successive cohort of children that followed the 1990 admission group moved to adoption at a faster rate than the children admitted in 1990. A more thorough analysis of these trends indicates that during the early portion of the decade (1990 to 1994), adoption rates were unchanged.32 That is, adoptions were neither slowing down nor speeding up. Near the midpoint of the decade, but before ASFA was passed, adoptions began to accelerate, probably because state initiatives were having an impact. Once ASFA was enacted, the tendency for adoptions to happen faster continued, contributing to the notably faster rate of adoption for children admitted in 1997 compared to children admitted in 1990. The third panel of data shows reunification trends over the same time period. These data indicate that as adoptions were speeding up, reunification was slowing down. For example, the relative rate of discharge to reunification among children who entered care in 1997 was 0.87, or about 13% slower than similar children admitted in 1990. The decline in rates of exit for children was persistent over the eight-year period. Because more children have reunification than adoption as a primary permanency plan and outcome, the net effect of slower reunification canceled the effect of faster adoptions, so that for the caseload as a whole, exit rates were stable. The data indicate that approximately 28% of the children admitted in 1990 reentered foster care over the next 10 years. The reentry rates for the 1991 and 1992 groups are about the same, an indication that reentry following reunification is relatively rare after about eight years. 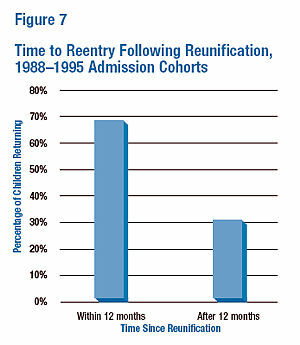 Reentry rates for children admitted between 1993 and 1997 were between 20% and 26%. After 1997, reentry rates fall off, but only because of the shorter observation period. Because policy and practice are geared to reunifying children quickly, the relationship between placement duration and subsequent reentry offers some insight into the difficult decisions facing social workers. For example, as shown in Figure 6, children reunified after short placements are those most likely to return to placement. Children reunified following relatively longer placements appear to have lower reentry rates (25%), but that is not an indication that children should stay in foster care longer in order to lower reentry rates. Rather, the statistic seems to suggest that the ability to sustain a parent-child relationship during a long separation is probably linked to lower reentry rates. To summarize, the data from the Multistate Foster Care Data Archive can be used to extend our understanding of reunification. Children who enter foster care tend to leave quickly if they are reunified. However, the likelihood of reunification falls off sharply after the first year. Among children who have been in foster care for more than three years, the likelihood of adoption actually exceeds that of reunification.36 Moreover, the backlog of children awaiting adoption in the 1990s was due largely to the increase in admissions early in the decade. The pace of adoptions actually increased, whereas reunification rates slowed during this period, a trend that has received little to no attention. Finally, although there are important state and local differences in rates of reentry, these data suggest that one out of every four children who goes home returns to foster care. Perhaps more than any other single piece of data, the likelihood of reentry serves as a reminder that the preference for reunification, absent an investment in families, is no guarantee that children will remain with their parents. The preference for reunification is rooted in American traditions that afford parents constitutionally protected rights, thus it is rather unlikely that the basic framework for child welfare policy and practice in the United States will change significantly in the years ahead. As states devise strategies to meet the needs of children, the U.S. Supreme Court’s words in Quilloin v. Walcott are again instructive. The state may not “force the breakup of a natural family over the objections of the parents and their children, without some showing of unfitness and for the sole reason that to do so was thought to be in the children's best interests.”37 Thus, states will continue to turn first to parents when planning a permanent home for a child who has been placed in foster care. Child welfare officials will seek out other caregiving arrangements only if the parent cannot or will not provide adequately for the child. However, the need to identify workable strategies that reduce time in placement prior to reunification and the likelihood of reentry has never been greater. The federal Child and Family Service Reviews stress reduced time in care and lower reentry rates among other outcomes.38 If a state fails to achieve substantial conformity with the federal standards, the public child welfare agency could face fiscal sanctions. In this last section, the discussion turns to the policy and practice implications that form the challenge ahead. funding for child welfare services generally and foster care specifically. Percentage of children admitted in a year who reenter care within 12 months of a prior episode. Of all the issues confronting the child welfare system at this juncture, changing the federal measurement system is quite possibly the most important. In the current plan, DHHS proposes to compare states on these indicators at two different points in time to determine whether the observed changes are consistent with better performance. Although the basic approach is sound, there are fundamental problems with the way DHHS measures performance.39 For example, the reunification standard is based on all children who have exited care (an exit cohort) through reunification. This group is useful to look at for some purposes, but this view of the foster care population excludes children still in care. Therefore, the federal standard does not measure the likelihood of reunification. Also, members of an exit cohort are a select group of foster children, different in ways directly related to system performance. 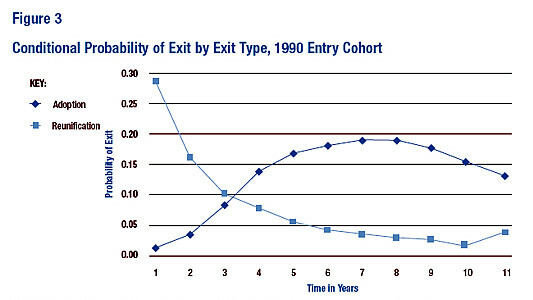 For example, exit cohorts systematically favor children who leave placement after short stays. This situation leaves the impression that the amount of time children spend in foster care is much shorter than it is when measured using the experiences of all the children placed in foster care. As a result, this view can be misleading. In fact, a state’s measured performance could show improvement when in actuality performance is declining. Thus, state actions and federal sanctions based on these measures could be predicated on inaccurate perceptions regarding state performance. The second policy area currently hindering efforts within the child welfare system to improve outcomes for children in foster care has to do with how child welfare services are financed. On the positive side, federal funding for in-home services has increased in recent years.40 However, as discussed in the article by Allen and Bissell in this journal issue, a large share of federal child welfare revenue goes to support foster care programs allocated through per-diem claims that can be made only if a child is in foster care. If a child is discharged from foster care, the basis for making a federal claim disappears, along with the associated revenue. 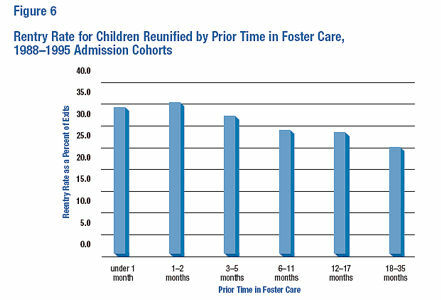 As it now stands, the harder child welfare service providers try to reduce foster care utilization from current levels “either by lowering admission rates (placement prevention), reducing time in care (earlier permanency for children), utilizing less-restrictive settings, or lowering the rate of reentry “the less federal revenue will be available to provide services, even if the changes in service utilization are predicated on the judgments of professionals who choose alternatives to foster care as a way to meet client needs. Under the current federal funding structure, agencies have to draw primarily on state and local dollars to provide services to families outside foster care.41 Without a permanent solution to this structural dilemma, the federal government’s fiscal commitment to foster children will diminish over time, as states successfully meet federal reunification standards. Of all the child welfare services studied over the past few decades, reunification services have rarely attracted the kind of attention dedicated to other child welfare services, such as family preservation. Thus, the evidence base for successful reunification programs and practices is especially thin, even by child welfare standards. Some researchers have reported favorable results when they worked to increase collaborative relationships with parents, build family-based strengths, address concrete services, and offer aftercare services. But few clinical programs have been rigorously tested using experimental designs. In their review of reunification programs conducted for DHHS,42 researchers could find only two examples of controlled studies (studies that used randomized assignment of clients to treatment and control groups) that tested family reunification services: a study conducted in New York State and another conducted in Utah. In the Utah program, members of the treatment group received intensive services featuring skill building, assistance with concrete services, and help with family members. Families in the treatment group experienced higher reunification rates than families in the control group.43 However, this study also found that reentry into foster care for families in the treatment group approached 27%, comparable to the rate reported in Figure 6. From a service perspective, it is also important to note that some research, however limited, shows that children in foster care sometimes fare better than their counterparts who were reunified. For example, another study followed a fairly small sample of children in San Diego, looking for well-being differences among children who went home and those who stayed in care.44 Results indicated that children who went home engaged in more risk behaviors and exhibited more behavioral problems. Because the sample is a small one from a single city, it is hard to generalize to other populations and places. Still, the findings serve to remind us to think very carefully about reunification, the process for deciding when a child is ready for reunification, and the services needed to reintegrate the child within the family and community. reunification services. A discussion of these promising practices follows. Most researchers agree that visits must be part of a planned process addressing the setting, preparation, and various perspectives of parents, children, foster parents, and social workers.46 One study found that children whose parents adhered to court-recommended visitation schedules were more likely to be reunified than were children whose parents had not done so. Family visitation is often viewed as the heart of family reunification. Continuing family connections when children are in care increases the likelihood of reunification and may ease the process of reintegrating a child back into a family. of cultural differences in the ways families raise children and the ways family members respond to crises within the family circle, to avoid missing signs that a family is ready to bring a child home. The importance of aftercare services as a component of the service continuum available to children and families is readily apparent given that more than 25% of children who are reunified later return to foster care. Concrete services such as housing assistance or respite care, as well as “soft” services such as counseling, can ease the reunification process. In addition to providing needed services, social workers can assist parents and children as they adjust to family reunification. They can help families understand, anticipate, and appropriately respond to challenges they may face in the reunification process. mandate aftercare services.52 In most child welfare agencies, post-reunification services are at first intensive but then taper off to less-frequent contact. Yet some families may need some level of services indefinitely. awareness of the importance of reunification has to be increased. States report that greater attention is being paid to the ASFA milestones (the 15/22-month rule), but it is not clear how states are dividing their attention between adoption and reunification.53 Adoption likely gets more administrative attention because the burden falls more squarely on the state. In the case of reunification, the burden of action and compliance rests with a family that has diminished credibility. From the state’s perspective, adoption incentives are clearer. Overall, a clearer focus on reunification and reentry as outcomes should help restore the importance of reunification. Federal and state efforts to measure child outcomes will not solve all the problems in the child welfare system, but simply knowing and tracking children as they enter and leave foster care offers a foundation for improving the lives of parents and children.54 Renewed attention to family reunification is imperative if the child welfare system is to create a more consistent and coherent approach to unifying and supporting families. 1. Portions of this section were adapted from Wulczyn, F., Zimmerman, E., and Skyles, A. Relative caregivers, kinship foster care, and subsidized guardianship: Policy and programmatic options. Chicago: Chapin Hall Center for Children, University of Chicago, 2002. 2. The U.S. Supreme Court recognized parents” fundamental-liberty interest in the care and custody of their children in its decision requiring clear and convincing evidence of parental unfitness before termination of parental rights. Moreover, the Supreme Court observed: “We have little doubt that the Due Process Clause would be offended “if a State were to attempt to force the breakup of a natural family over the objections of the parents and their children, without some showing of unfitness and for the sole reason that to do so was thought to be in the children's best interests. Quilloin v. Walcott, 434 U.S. 246, 255 (1978). 3. Troxel v. Granville, 530 U.S. 57 (2000); and Parham v. J.R., 442 U.S. 584 (1979). 4. As the court noted in Santosky v. Kramer, “While there is still reason to believe that positive, nurturing parent-child relationships exist, the parens patriae interest favors preservation, not severance, of natural familial bonds.” Santosky v. Kramer, 455 U.S. 745 (1982). 5. In the matter of Michael B., 80 N.Y.2d 299, 590 N.Y.S.2d 60 (1992). 6. According to the Oxford Dictionary of Law, a presumption is a supposition that the law either allows or requires. “Some presumptions relate to people, e.g. the presumption of innocence and of sanity. Others concern events, e.g. the presumption of legality (omnia praesumuntur rite et solemniter esse acta: all things are presumed to have been done correctly and solemnly). Most relate to the interpretation of written documents, particularly statutes. Almost every presumption is a rebuttable presumption, i.e. it holds good only in the absence of contrary evidence. Thus, the presumption of innocence is destroyed by positive proof of guilt. An irrebuttable presumption is one that the law does not allow to be contradicted by evidence, as, for example, the presumption that a child below the age of 10 is incapable of committing a crime (see doli capax).” Dictionary of law. Oxford: Oxford University Press, Market House Books, Ltd., 1997. 7. Adoption Assistance and Child Welfare Act of 1980 (P.L. 96-272); Indian Child Welfare Act of 1978 (25 U.S.C.A. “” 1901–1951); and the Adoption and Safe Families Act of 1997 (P.L.105-89). 8. Stein, T.J. The Adoption and Safe Families Act: Creating a false dichotomy between parents” and children's rights. Families in Society (2000) 81,6. pp.586–92. 9. ASFA includes a requirement that states allocate up to 20% of the Title IV-B, subpart II funds for post-reunification services. However, in the context of total spending for foster care services and the dramatic increase in the number of children going home, the resources are limited by comparison. Also see note 8, Stein. 10. The 15/22-month rule is troublesome for some because the process of rehabilitation can take longer than 22 months, especially when substance abuse is involved. Relapse is part of the recovery process. If a child is placed with a relative, the issue is not so acute, as placement with a relative serves as an exception to the rule. Otherwise, a mother midway through the recovery process might be faced with having her parental rights terminated, a setback that could have deleterious consequences for her. 11. Relative guardianship is another permanency option that states are using more frequently. See the article by Testa in this journal issue for more information. 12. U.S. Department of Health and Human Services, Administration for Children and Families. AFCARS, Report #8. Washington, DC: DHHS, August 2002. Available online at http://www.acf.hhs.gov/programs/cb/publications/afcars/report8.htm. State Statute Series Ready Reference: Permanency Planning: Concurrent Planning. Washington, DC: National Adoption Information Clearinghouse, 2002. Available online at http://nccanch.acf. 14. Katz, L. Concurrent planning: Benefits and pitfalls. Child Welfare (1999) 78, 1:71–87. 15. See note 14, Katz. 16. See note 14, Katz. 17. Hess, P.M. Parental visiting of children in foster care: Current knowledge and research agenda. Children and Youth Services Review (1987) 9, 1:29–50. 18. Westat and Chapin Hall Center for Children. Assessing the context of permanency and reunification in the foster care system. Washington, DC: Department of Health and Human Services, 2001. 19. Littell, J., and Schuerman, J. A synthesis of research on family preservation and family reunification programs. Chicago: Westat, James Bell Associates, and the Chapin Hall Center for Children at the University of Chicago, May 1995. 20. See note 19, Littell and Schuerman. 21. See note 19, Littell and Schuerman. 22. Freundlich, M., and Wright, L. Post permanency services. Washington, DC: Casey Family Programs, 2003, p. 47. 23. Landsverk, J., Davis, I., Ganger, W., et al. Impact of child psychosocial functioning on reunification from out of home placement. Children and Youth Services Review (1996) 18:447–62. 24. See note 19, Littell and Schuerman. Goerge, R. Foster care dynamics 1983–1988. Chicago: Chapin Hall Center for Children, 2001. The archive’s 12 states (Alabama, California, Illinois, Iowa, Maryland, Michigan, Missouri, New Jersey, New York, North Carolina, Ohio, and Wisconsin) account for approximately 55% of children in foster care nationwide. Although the states in the archive are diverse, they are not necessarily representative of the states not included. A more representative sample of states might yield slightly different results. 26. The data in Figure 2 describe how children left their first episode of foster care. Children who return to care for a second episode may exit for other reasons. 27. See Wulczyn, F. Closing the gap: Are changing exit patterns reducing the time African American children spend in foster care relative to Caucasian children? Children and Youth Services Review (2003) 25,5–6:431–62; and note 18, Westat and Chapin Hall. compared to 26% of Caucasian babies. 29. 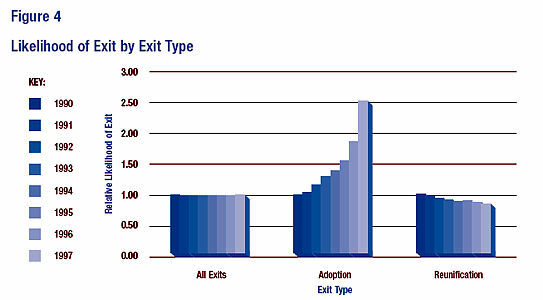 Although other exit types (for example, discharge to other family members) were included in the calculations used to produce Figure 1, comparable data for other exit types are not displayed. 30. According to the archive dataset, about 5% of children admitted prior to their thirteenth birthdays were still in their first placement episode, even though 10 years had passed. age, race/ethnicity, type of placement, state of residence, and urban character of home county are included in the model. 32. Wulczyn, F. Adoption dynamics: The impact of the Adoption and Safe Families Act. Chicago: Chapin Hall Center for Children, University of Chicago, 2002.
of the shorter observation period available for the later cohorts. 34. Festinger, T. Going home and returning to foster care. Children and Youth Services Review (1996) 18,4–5:383–402. 35. Jones, L. The social and family correlates of successful reunification of children in foster care. Children and Youth Services Review (1998) 20:305–23. 36. The basic pattern is true in all states. However, it is important to remember that state-level differences (and county-level differences within states) are substantial. The state and county variation holds important clues as to the effectiveness of different approaches to reunification and adoption. Very little research examining these differences has been undertaken. parent’s fitness. See Froelich v. Clark (In Re L.L. ), 745 N.E.2d 222 (2001). 38. For further discussion on this topic, see the article by Allen and Bissell in this journal issue. including those targeted to children being reunified. However, it must be noted that most of those funds are allocated at the system’s “front end,” and the mandate to use the funds for reunification services is relatively weak. 41. The Title IV-E waiver program affords some flexibility in the use of Title IV-E funding, but waiver programs have limited scope and duration. 42. See note 19, Littell and Schuerman. 43. Fraser, M.W., Walton, E., Lewis, R.E., and Pecora, P.J. An experiment in family reunification: Correlates of outcomes at one-yearfollow-up. Children and Youth Services Review (1996) 18,4–5:335–61. 44. Taussig, H., Clyman, R., and Landsverk, J. Children who return home from foster care: A 6-year prospective study of behavioral health outcomes in adolescence. Pediatrics (2001) 108, 1:E10. 45. Burford, G., Pennell, J., and MacLeod, S. Manual for coordinators and communities: The organization and practice of family group decision making. St. John's: Memorial University of Newfoundland School of Social Work, 1995. Haight, W.L., Black, J.E., Mangelsdorf, S., et al. Making visits better: The perspectives of parents, foster parents, and child welfare workers. Child Welfare (2002) 81, 2:173–202; Hess, P.M. What caseworkers consider in developing visiting plans for children in foster care. Champaign-Urbana: School of Social Work, University of Illinois, 1987; note 17, Hess; and Leathers, S.J. Parental visiting and family reunification: Could inclusive practice make a difference? Child Welfare (2002) 81, 4:571–93. 47. The article by Brenda Jones Harden in this journal issue examines the importance of child development. 48. Chamberlain, P., and Reid, J.B. Comparison of two community alternatives to incarceration for chronic juvenile offenders. Journal of Consulting and Clinical Psychology (1998) 66, 4:624–33. hospitalization of youths in psychiatric crisis: Clinical outcomes. Child and Adolescent Psychiatry (1999) 38, 11:1331–39. Findings from the Comprehensive Child Development Program. Early Childhood Research Quarterly (2000) 15, 1:5–39; and Bickman, L., Lambert, E.W., Andrade, A.R., and Penaloza, R.V. The Fort Bragg Continuum of Care for Children and Adolescents: Mental health outcomes over five years. Journal of Consulting and Clinical Psychology (2000) 68, 4:710–16. 52. Kerman, B., Wildfire, J., and Barth, R. Outcomes for young adults who experienced foster care. Children and Youth Services Review (2002) 24, 5:319–44. 53. See note 18, Westat and Chapin Hall. 54. Brim, O.G. Macro-structural influences on child development and the need for childhood social indicators. American Journal of Orthopsychiatry (1975) 45, 4:516–24.